ience in conventional and Bakken operating systems in Southeast Saskatchewan, and we have a good working relationship with ECON, local vendors, and landowners. 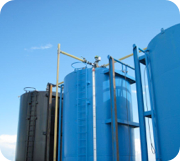 Our company provides design and supervision for gas recovery systems, flowlines, gathering systems, battery builds and turnarounds, equip/ties, tank inspections, and other post-completion activities. Woodley Well Services Inc. assists with cost tracking and quality control on all projects.